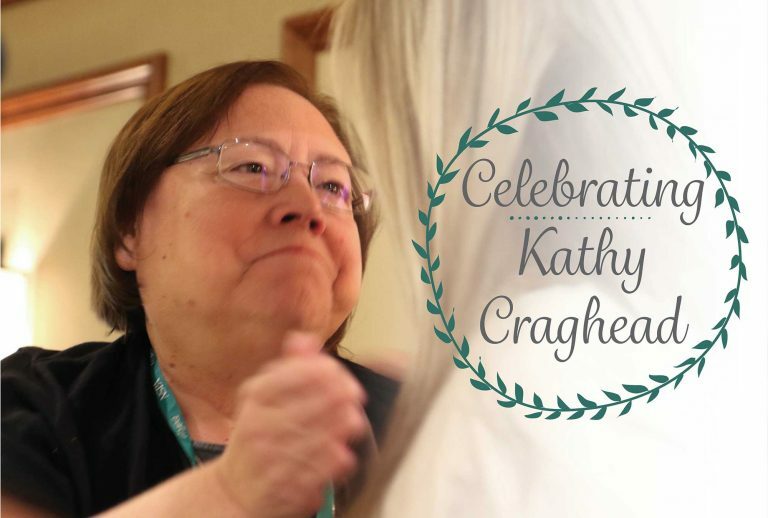 Kathy Craghead was a respected, influential and loved member of the scholastic journalism community. Her death in May is still being felt – from her absence at yearbook conventions, to her ability to review yearbook copy with a fine-tooth comb. As a tribute to her, longtime friend Jim Jordan interviewed 15 of Kathy’s many close friends. You can hear what they have to say on this special episode of the Yearbook Chat with Jim podcast. Long-time yearbook adviser Kathy Craghead passed away Wednesday, May 23, 2018. 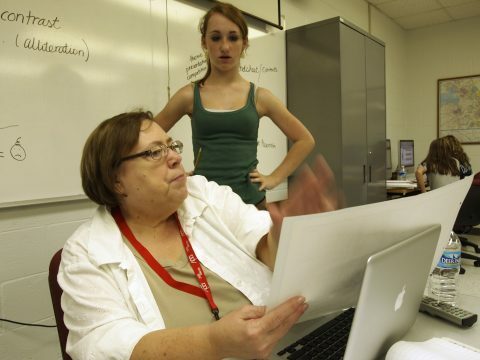 She spent 24 years as the yearbook adviser at Mexico High School in Mexico, Missouri, before retiring in 2007. In 2003, she was named the H.L. Hall National Adviser of the Year by JEA. 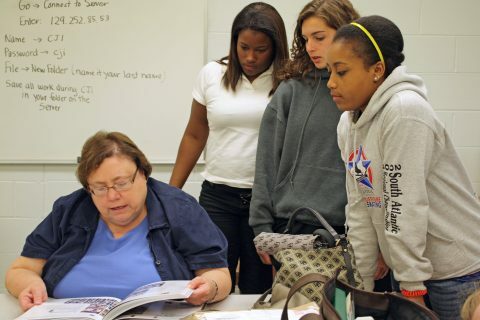 After retiring, she spent time as a yearbook instructor and served as a judge for yearbook organizations. Kathy was well known throughout the yearbook world. She is remembered for her dry wit, high standards and emphasis on writing and journalism. The impact she made is apparent from the many people, from all over the country, wanting to share their memories. Anyone who knew Kathy wanted to talk about her. She made a lasting impression and will be missed by many. We reached out to some of Kathy’s closest yearbook friends and asked them to reflect on her life and the many ways she influenced the yearbook world. Close friend and fellow yearbook adviser Nancy Hastings, MJE advised Paragon yearbook at Munster High School in Munster, Indiana, for 38 years. She met Kathy at a journalism workshop in the early 1980s, where Kathy had been brought in as a writing instructor. Hastings also noticed how Kathy was adept at taking new yearbook advisers under her wing to help them grow. “Young advisers who needed to understand how to survive, how to do the job,” said Nancy. Nancy was one of many people to comment on Kathy’s humor and strong personality. Kathy made a lasting impression on Walsworth President Don Walsworth. Walsworth Journalism Specialist Mike Taylor, CJE, knew her long before he came to Walsworth. He talked about how she was friendly and really cared about the kids, but always found a way to have fun. He called her an amazing writing teacher. Jim Jordan, who taught yearbook for 35 years at Del Campo High School in Fair Oaks, California, wrote down his thoughts on Kathy’s life. We first met in the late ‘80s at the Ball State workshops and then we worked together at many more workshops throughout the ‘90s. Kathy was one of the pioneers in promoting the power of great writing in yearbooks. She loved a great theme and beautiful design, but she believed the heart of any great yearbook, of any publication, is its writing. She preached this truth wherever she went and wherever she taught. We all loved Kathy’s great sense of humor and dry wit. She was a truth teller, a woman of flawless integrity. If something wasn’t right you knew Kathy was going to tell you; but that look she would give you — that laugh and wry smile — made you realize what she was telling you was right. At conventions, I couldn’t wait to see her and Nancy Hastings for the first time. I’d yell ‘Baby!’ as loudly as I could when I saw her. She would reply ‘Darlin’’ and then I’d give her a huge hug. I can’t imagine that I won’t be able to do that ever again. Walsworth yearbook representative Missy Green first met Kathy more than 35 years ago. Green remembered Kathy’s skill at being an instructor, especially when it comes to writing. H.L. Hall is a giant in the industry. The H.L. Hall National Adviser of the Year recognition – which was awarded to Kathy in 2003 – was named after him. He served as the publications manager at Kirkwood High School in Kirkwood, Missouri, from 1973 to 1999. Walsworth yearbook representative John Kelley mused on how Kathy touched his life, in more than just yearbook. Dow Tate is the yearbook adviser at Shawnee Mission East, in Prairie Village, Kansas. He is in year 30 of advising. He remembered how her humor would add to workshops he attended. She’d use that sharp wit to put people at ease and talk them through yearbook. Becky Tate has been the yearbook adviser at Shawnee Mission North in Overland Park, Kansas, for 28 years. She discussed Kathy’s influence on her career as an adviser. Becky envied Kathy’s ability to teach writing but looked forward to the two times a year she saw Kathy at yearbook conferences. Kathy would greet her with a hug and ask about her life, remembering little details. Kathy’s death is a great loss for the yearbook community. She was loved for her personality and respected for her skill. You are invited to share your reflections in Comments below. Our hearts are with Kathy’s close friends and family. Thank you to everyone who shared their memories.